Sometimes nothin' beats a vast, unending stretch of sand that crops up in a flick. The heat, a camel or two, and some guy with cracked lips and raggedy clothes groaning 'Watttterrrrr...'. Ya gotta love it- and you'd better, if you want to survive this week's quiz! 5) What was the name of the desert planet in "Star Wars"? 8) What did Indiana Jones find in the desert just outside of where the Nazis were digging, in "Raiders of the Lost Ark"? 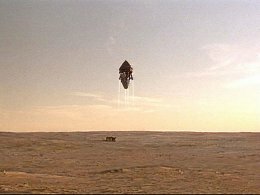 6) How about the desert planet in "Dune"? 9) Which movie DIDN'T have desert sequences that took place somewhere in Africa? 7) Which movie character fled into the desert with his army, only to become the only survivor as the other members died off one by one? 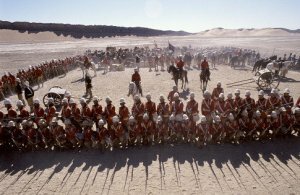 10) Which movie had a sequel which featured extensive scenes taking place in the desert?